We are now in the annual renewal of spring, which is something that gives hope to us all under any temporary daunting or discouraging circumstances. 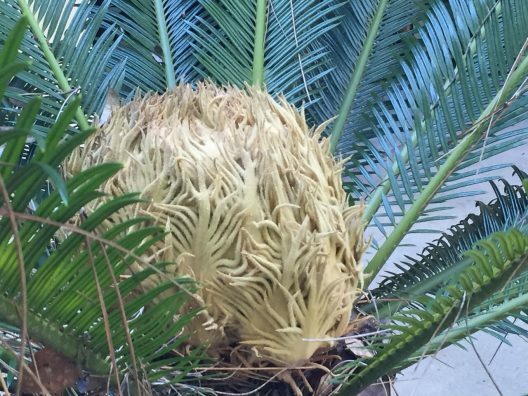 Two years ago, the sago palm at the corner of my house bloomed. She hasn’t been the healthiest of plants, wedged in under the eave near the garage. A few years earlier, my husband and I had hired a master gardener to put in some new flower beds, and I had asked her whether it wouldn’t be best to move the sago out from under the eave. She said no, though later I grew skeptical of that answer as the sago rose taller and taller. Now, she leans at a funny angle out from the house, and we have to lop most of the fronds off the side near the sidewalk. We took the bloom as a sign of vigor. In the middle of the circle of spiky green fronds, surreal feathery, soft golden-yellow tentacles reached out in a wide swath. By the middle of summer, those feathers had formed a tentacled globe worthy of any science-fiction tale. We watched it form and change in fascination. It was stunningly beautiful and strange, and I marveled over it every time I pulled into the driveway. But after the summer rains started to fall, the soft, golden globe collapsed, and I wondered whether the sago needed care. As a non-native gardener, I took to the internet, searching whether I should “dead-head” a sago the same way you do a host of other plants post-flowering. I found no definitive information, but several discussion boards noted that the sago would be fine whether cleaned up after blooming or not. I left ours alone. I would stop by and check on the fading bloom—it flattened, then mostly sloughed off in the rains, leaving behind a mound of detritus that included some reddish lumps I understood were seed pods. Our sago is a batchelorette—there are no males nearby to fertilize her seed pods—and over time…well, nothing happened. The next spring, I waited for the sago to put out her usual new fronds—an annual ritual I’ve always enjoyed. There’s nothing like watching a fern or palm frond unfurl. It feels like living in a series of time-release photos because the pace is rapid enough that you can see the change from day to day, but not so fast that you see actual motion. Alas, what continued to happen was nothing. I trimmed a couple of dying fronds, but still no new ones appeared. Another year went by, and this spring I renewed my search for information. Was there anything that could re-invigorate our palm? She still had a few spindly fronds that were yellowing at their bases, and by now her top looked crusty and brown. In despair, I confessed to my husband that we might need to just remove the venerable sago. We had tolerated her interference with the sidewalk, we had used insecticidal soap to keep down the aphids, we had nursed her, but she wasn’t in a great spot, and she didn’t seem to be coming back. Then we had out-of-town guests, a long trip ourselves, and the busy spring academic season that means thesis defenses, final projects and performances, and all manner of things that occupy our attention. One day, though, when I pulled out of the garage I was delighted to see, as if from nowhere, numerous stalks poking up out of the middle of the sago, about four inches tall already. It was as if they had appeared overnight, and they have continued to grow at a rate of about an inch a day. Any day now, these 30 or 40 new fronds will begin the beautiful, luxuriant process of opening, uncurling. I can’t wait – not just for my sago, but for everyone: There are new fronds waiting to be uncovered and encouraged in all of us. In the meantime, I am rerouting the sidewalk.